Hopefully, Mr. Black will be the first of thousands. It is estimated that about 12,000 prisoners will see a reduction of about three years in their sentences. The Courts have been planning for the motions for months. Here's how it will work in the District of Colorado. Not every inmate sentenced for crack will get a reduction. FAMM has this handy FAQ outlining the requirements. 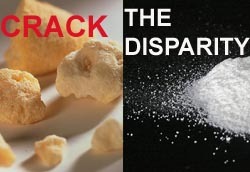 Via Law Prof Doug Berman at Sentencing Law and Policy: Judge Jack Weinstein has written another scathing indictment of our drug sentencing laws and policy in a multi-defendant crack cocaine case. Newly Released Crack Cocaine Defendants: How Are They Faring? The Washington Post today reports on some crack defendants who were able to leave prison early due to the recent retroactive sentencing guideline reductions. They seem to be coping pretty well, considering the changed world they've returned to after a decade or more behind bars. More than 7,000 crack cocaine offenders ... have received reduced sentences since March, when the U.S. Sentencing Commission put retroactive sentence guidelines into effect to offset what the commission felt were overly harsh punishments for crack cocaine related crimes, and it is an open question whether they will succeed or return to a life behind bars. ....Nearly 90 percent of those who received the tough sentences for crack cocaine were black men and women. Most users and dealers of powder cocaine are white and Latino. There were 19,500 federal inmates serving sentences for crack when the reduction went into effect in March. Many aren't eligible for the reduction for a variety of technical reasons. For others, mandatory minimum sentencing laws which trump the guidelines will prevent them from getting a reduced sentence. The Government files objections to scores of requests, arguing either that the reduction doesn't apply to a particular defendant or the court should exercise its discretion and deny the relief. The U.S. Sentencing Commission says 3,000 crack cocaine sentences have been reduced since the guideline amendment went into effect in March. There are 19,500 inmates serving time for crack cocaine. In the 40 or so motions I've seen filed in Colorado (cases in which I had one of many co-defendants) the Government seems to file an objection to every request. It either says the guideline doesn't apply or the court should exercise its discretion and deny the relief. I've mentioned before that the reductions are small, and only apply to a limited group of defendants. I only have one client out of dozens of crack defendants I've represented who appears to be eligible for relief. Sure enough, the Government is opposing the request.